Maples at the Sonatas, established by Wilcox Communities, spans 24-acres on the north side of Woodstock, Illinois. The picturesque Sonatas subdivision includes several models of maintenance-free, single-family ranch homes located minutes from Route 47 and the historic Woodstock Square. These new, luxury ranch homes combine generous living spaces with exquisite and thoughtful design. The single family homes at Maples at the Sonatas, priced from the low $200s, include two or three bedrooms, two bathrooms and attached 2 or 2.5 garages. Each boasts 9-foot tray ceilings, open floor plans and flexible living spaces that offer a private courtyard and four-season veranda. The “European Country” exterior elevations provide optimum curb appeal and the full exterior maintenance services give homeowners the opportunity for a carefree lifestyle. The new, decorated ranch-style single family homes are now open for tours. Step into one of the models that range in size from 1,516 square foot to more than 2,800 square feet of living space. Each model offers unique, luxury features from cozy fireplaces to stainless steel appliances and expansive windows that overlook the home's private courtyard. The luxury outdoor courtyard, accessed through sliding glass patio doors provides the ultimate space for entertaining friends and family or to enjoy quiet time with a good book on a lazy afternoon. The Palazzo model offers an optional four-season room and gourmet kitchen with center island while the Promenade model includes a generous 16' x 15' kitchen, ideal for entertaining family and friends plus a den/office space which also can be used as a guest room. Look to the Portico model for a bonus suite option and large mud room. With double-bowl vanity in the owner's bath plus a walk-in shower, the Portico combines luxury and functionality effortlessly. The new homes at Maples at the Sonatas offer homeowners the opportunity for spacious single-family living without having to worry about the hassles of exterior upkeep. The maintenance-free lifestyle within this planned community includes full exterior services such as snow removal and lawn maintenance. Put away that mower and shovel and have more time for family, friends and the "fun stuff" in life. Living a maintenance-free lifestyle at the Sonatas subdivision means more time to enjoy the community clubhouse. Designed exclusively for homeowners, the community clubhouse features a great room with cathedral ceilings, open floor plan, full kitchen, fireplace and ample natural lighting for a warm, friendly atmosphere. 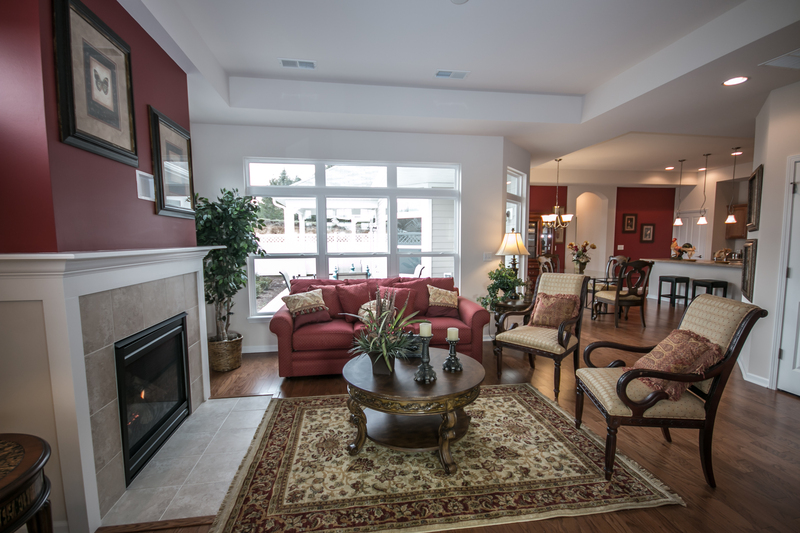 Meet friends and neighbors at the clubhouse for a morning coffee or afternoon game of cards. Homeowners can reserve the clubhouse kitchen and great room for private gatherings, ideal for birthday parties and other family events. The community clubhouse is the hub of the Sonatas neighborhood, the place to gather and to participate in one of the community's many exclusive social events such as "Coffee & Conversation" on Saturdays or Book Club on Tuesdays. In addition, the Maples at the Sonatas Clubhouse also offers a private fitness center and heated outdoor pool for its residents' exclusive use. Call Carol Lyons at (815) 334-0340 for more information about arranging a tour of one of the new, decorated single-family ranch homes at Maples at the Sonatas or visit the community online at http://www.wilcoxcommunities.com/neighborhood/maples-at-the-sonatas. The ranches offer open plans and plenty of natural light. 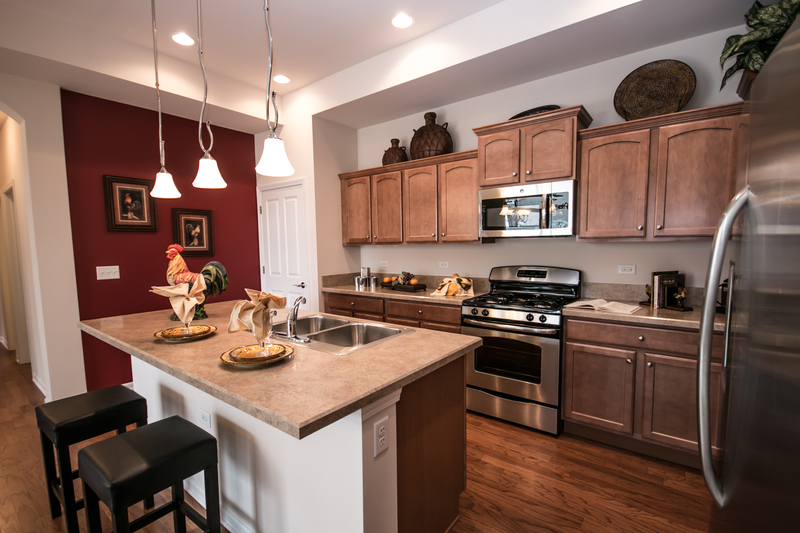 The Promenade Ranch Model offers a roomy kitchen with island. 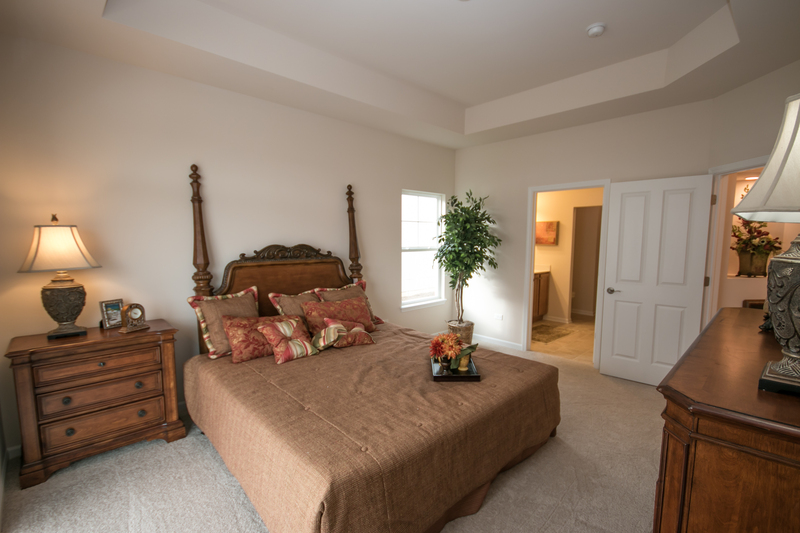 Volume ceilings, walk-in closets and large master baths complete the master suite. 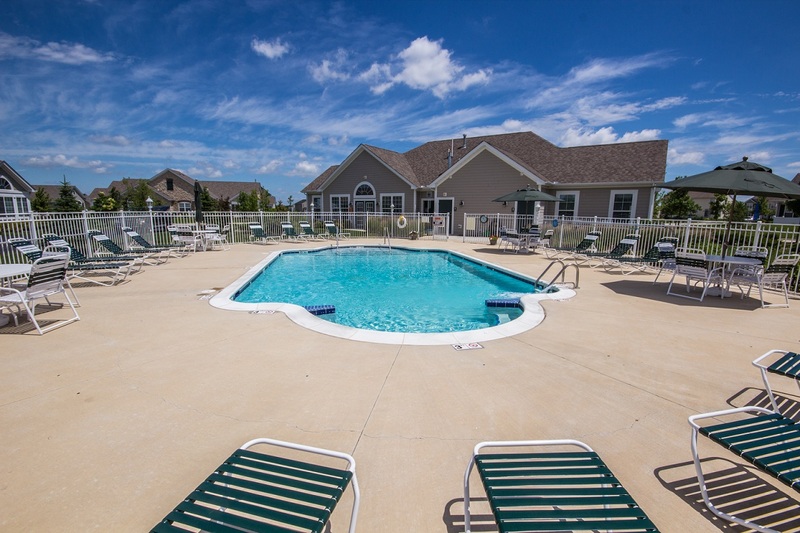 Clubhouse pool available exclusively for residents and guests.